An investigation into an alleged failed spread betting scam involving Matt Le Tissier in the 1990s has been dropped. In his autobiography, the ex-Southampton captain said he gambled on the time of the first throw-in in Saints' 2-0 win at Wimbledon in 1995. Police said discussions with the Crown Prosecution Service (CPS) concluded an investigation would not be in the public interest. The matter was taken up by police following extensive media publicity. Earlier this month, Le Tissier said he had not been contacted by officers and did not want to comment. Hampshire Constabulary said: "Following discussions with the CPS a decision has been made not to investigate an alleged historic and unsuccessful spread betting incident at a Saints football match in the 1990s. "Discussions with CPS have led to the conclusion that an investigation into the incident would not be in the public interest and does not represent appropriate use of police resources. "The incident itself was bought to the attention of the police after it was mentioned in a recently published autobiography." An FA source said it was aware of the police response and the association would be ending its own inquiry. In the book, 40-year-old Le Tissier said he tried to kick the ball out of play, but it was kept in by Neil Shipperley, who was unaware of the bet. 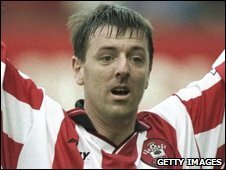 As Southampton captain, Le Tissier was able to persuade his Wimbledon counterpart to let the Saints kick off in exchange for letting the Dons kick towards their own fans, he said in the book. "As it was live on television, I didn't want to make it too obvious, so I tried to hit it just over his head," said Le Tissier. "But, with so much riding on it, I was a bit nervous and didn't give it enough welly." He added he had never tried spread betting since the incident.